Nintendo found itself more or less backed into a corner in recent years. Despite launching a year before the PlayStation 4 and Xbox One, sales of the Wii U were dismal at best. Things started to improve late last year, however, with the arrival of the NES Classic Edition although everyone knew the company’s fate hinged on the success of its next major console, the Switch. A flagship console that’s also a handheld is a risky endeavor but thus far, it’s paid off. Much of the Switch’s early success has to do with Nintendo’s return to old form – by that, I simply mean making great games. By most accounts, Super Mario Odyssey should have been a launch title alongside the Switch. That distinction, however, went to The Legend of Zelda: Breath of the Wild. Now, it is Mario’s time to shine as Nintendo’s next 3D platformer launches worldwide on October 27.
Review embargos lifted on Thursday, providing prospective buyers with plenty of opinions to mull over. Let’s dive right in. Above all else, Odyssey is refined. It generously doles out new worlds to explore, effortlessly cycling from one charming enemy and unique gameplay idea to the next. Its collection of open-world Kingdoms is varied and broad, and sometimes clearly inspired by Super Mario 64. Though it isn't necessarily a groundbreaking game like its ancestor, which redefined expectations for 3D games at large, Odyssey outpaces it at every turn. Its environments are bigger and some of the most interesting ever seen in a Mario game--just wait until you lay eyes on Bowser's elaborate fortress. All the extra space is invaluable, as the dense layouts of challenges and rewards justifies every building and landmass you encounter. There are two key elements that make it distinct from other Super Mario games in the series. One is a new character: Cappy, a sentient hat that allows Mario to possess objects and characters. It essentially replaces the power-up system from past games. Toss the hat on a Bullet Bill and you become an unstoppable rocket bursting through walls and enemies. Throw it on a frog and you can leap to even greater heights, while looking completely adorable. Many of the game’s puzzles are designed around figuring out how to utilize this strange array of abilities to get around. 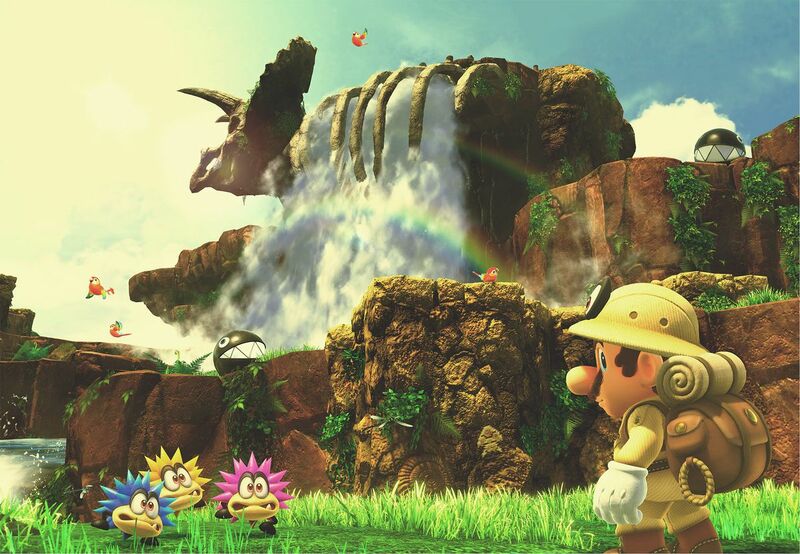 In addition to Cappy, Odyssey also introduces a greater range of worlds to explore, places that fall far outside the typical Mushroom Kingdom the series is known for. Most are the kinds of places you wouldn’t necessarily expect Mario to be, from the New York-like cityscape of New Donk City, to a dark, crumbling castle that looks ripped right out of the gothic fantasy series Dark Souls. By adding these two aspects together — possession and new locations — the designers at Nintendo have been able to craft an experience that constantly introduces new concepts. I had one single and minor frustration: the controls. Let me be clear here that the controls aren’t bad by any means, but given the sheer number of possible moves at Mario’s disposal, there’s, uh, a lot to learn. Certain complex moves can require eventually holding down three or more buttons, all pressed with perfect timing, or letting go of buttons at the right time. And most annoyingly, a few options require the use of motion controls. If you’re playing with the Switch’s Joy-Con controllers, the motion control moves are pretty easy. But as someone who still regularly experiences desyncing problems with the Joy-Cons, I preferred using the Pro Controller or playing in handheld mode. While motion controls still work with both of those setups, they’re awkward as hell to pull off. I cannot stress enough, however, that this is a minor quibble. There are a limited number of points throughout the game that require motion control; even spots that seem like they need it often have a workaround if you’re really desperate to not waggle your controller. That freedom is really Super Mario Odyssey’s greatest strength, too.